Now it seems that Amazon has gotten on the bandwagon of downloadable original programming for kids. Premiering earlier this month was their latest series called Wishenpoof, about a little girl with the power to make her wishes come true. From Marketwatch.com: “Created by Angela C. Santomero (Blue’s Clues, Creative Galaxy, Daniel Tiger’s Neighborhood, Super Why! 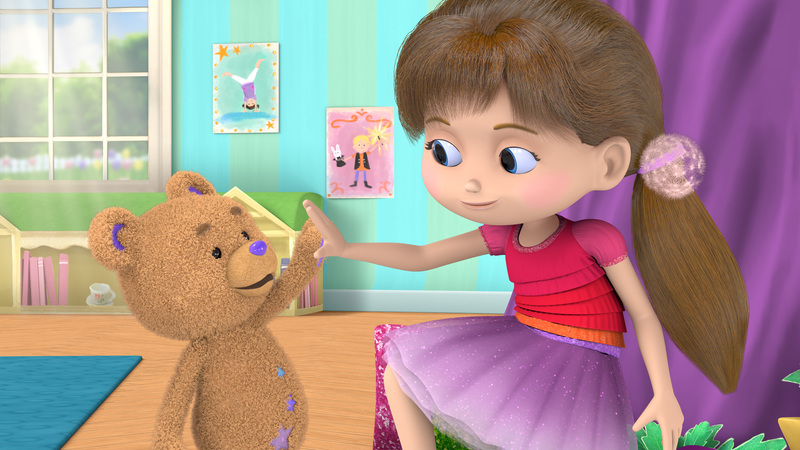 ), and produced by Out of the Blue Enterprises, Wishenpoof is an animated preschool series that revolves around Bianca (Addison Holley, Annedroids, Daniel Tiger’s Neighborhood) as she solves life’s problems in her own creative ways because with magic, or without, we all have the power to make good choices.” Bianca’s constant companion throughout her adventures is a plushie known as Bob the Bear. Wishenpoof is available as a free download to subscribers of Amazon Prime.